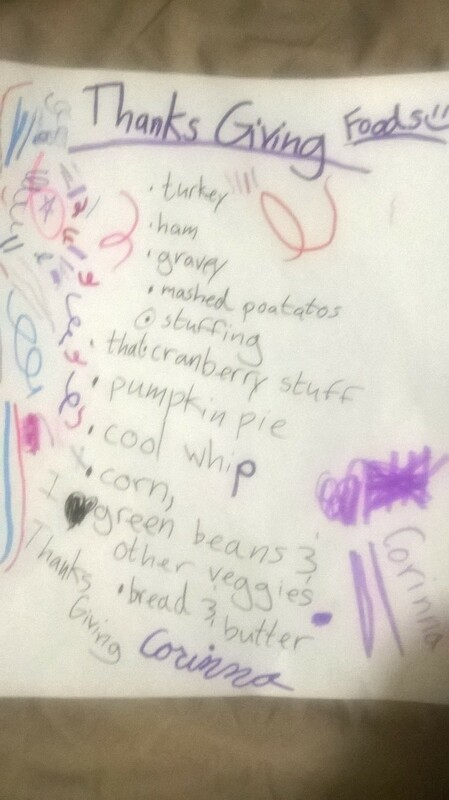 With Thanksgiving fast approaching, my girls like to create a menu of items they would like me to prepare for our feast. What food items would be on your ideal Thanksgiving menu? Be specific. My ideal thanksgiving meal would include: a slow smoked turkey, baked macaroni and Cheese, cheesecake, collard greens, baked beans, green beans, veggitable tray, and my grandpas homemade punch. The turkey needs to be cooked for at least six hours in a smoker with various spices to let them all marinate deep into the turkey’s meat. The baked mac’n’cheese would be home made, no boxes containing all the necessary ingredients. I would make an ample amount of my famous double layer pumpkin cheese cake so there would be plenty to go around. The collard greens would have ham in them while they cooked. My mom would make the baked beans so that when you mix them in with the mac’n’cheese they complemented one another. The green beans would also have ham in it while they cooked, along with butter. The vegetable tray would have peanut butter to dip the carrots, celery, and apple slices in. It would also have ranch for the cucumbers, nothing for the mini sweet pickles that I love so much. Corn that was cut off the cob during the summer and was froze to keep good. Texas toast since I am from Texas it is only expected! Texas toast! I think I will use that this year for my required “bread and butter” from my daughter’s list. Oooh! I like the idea of Polish sausage added to the meal. -Not your average Thanksgiving foods! Yummm! I started drooling at the lobster tails. Wow!!! I will have to try the Special Mashed Potatoes. Chicken Parmesan . . . yum! I once made lasagna for Thanksgiving. My ideal Thanksgiving starts with donuts from the bakery down the street and a glass of chocolate milk. Then I would have a batch of blueberry muffins all to myself. As for the main meals that people think of when Thanksgiving comes to mind, I have my uncle’s special corn on the cobb made with the secret ingredients. Mashed potatoes are a must. My grandma’s Gabby noodles (chicken and dumplings, but named after me for my family). Homemade apple pie delivered to my house made by my Aunt Cindy. Pumpkin pie at my mom’s parents’ house. Homemade rolls made by dad’s sister. I personally make the eggs. I’m not a turkey person, or ham, so not much meat. And! On Friday (FatGirlFriday Thanksgiving left overs edition) my best friend and I will celebrate our favorite holiday, the day after Thanksgiving movie day filled with the same food from the day before. Movie day with leftovers. . . sounds divine! What are the secret ingredients for the corn on the cob? Sounds like a plate I would be happy to eat . . . Yummers! I would want baked macaroni and cheese with as many cheeses as possible. The top would have to be light gold and when getting a serving the cheese would have to stretch from the pan to your plate. Along with that I would want honey smoked ham glistening out the oven. Dressing would also go with the meal topped with cranberry sauce. And to end it off spicy greens would be nice. For dessert i would like a triple layer double chocolate cake the way my mom makes covered with chocolate icing. If you didnt know by now I like chocolate. All of it washed down with cold white milk. Triple layer double chocolate cake . . . sold! My ideal thanksgiving dinner with my large family would include a variety of items. I would have my choice between turkey or honey glazed ham. Also stuffing, cranberry sauce, baked macaroni and cheese, deviled eggs, rolls, green bean casserole, baked beans, and corn. I’m sure I’m leaving things out, but I will just have to wait to find out. Dessert is when it gets tough because I love them all. These include pies such as buttermilk, pumpkin, cherry, apple, and chocolate. I always have to make sure I get a piece of my grandmothers classic chocolate cake because that one runs out fast. Ooooh! Buttermilk pie . . . I might have to try and make one of those.